For Mama’s Sunday brunch today, I made her favorite basted eggs over sourdough toast. All three yolks turned out perfectly runny, and she loved them! I felt so pleased to have gotten them just right. And I was happy to make her a special meal after my horizontal day yesterday. 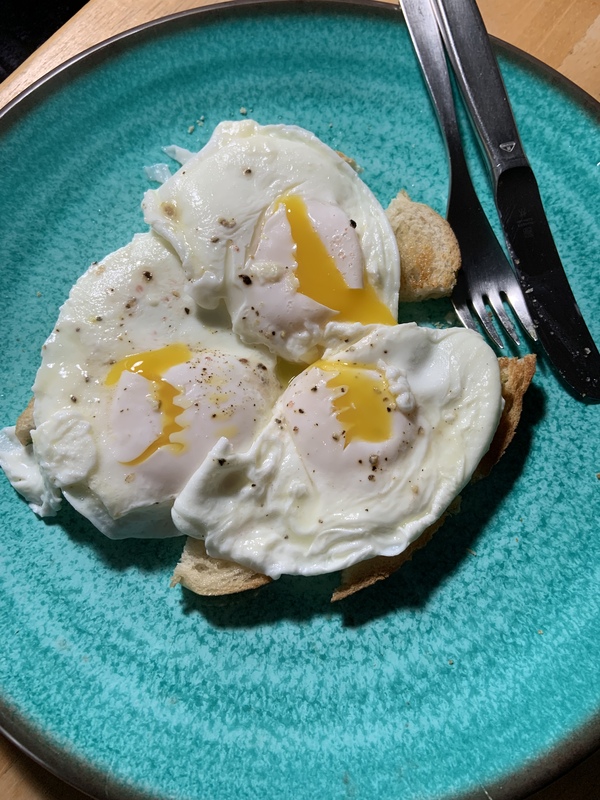 Today’s #OneGoodThing was successfully making eggs just the way Mama likes them! What was your #OneGoodThing today? Please share in the comments! Day 34 of 365. And Day 1,130 in a row (here’s the first 366, & the following 365, & the third year of 365 good things)! Are those what we call ‘poached eggs’? You crack an egg into simmering water? I wondered the same thing, Bert. Similar, but not exactly the same as poached. I actually quite liked firmly poached eggs back when I ate eggs. But anyway, I digress. Basted eggs – at least the way Mama likes them – are made in a small frying pan with a tight-fitting lid. I melt a little butter or coconut oil to coat a hot pan. Crack 3 eggs into the melted butter without breaking the yolks. Quickly sprinkle a pinch of salt and pepper, then add a small bit of water before closing the lid tightly. Do not remove the lid. Once the whites are cooked, but the yolks are just starting to cook but still runny, remove the pan from heat. Carefully plate eggs onto toast or potatoes or veggies or rice/beans. Try not to break yolks before serving. Ta-da!